Welcome to Week 7 of the Kauai Photo Challenge! This week’s picture is from the Kauai All-Girl’s Rodeo, taken during the roping event. Horses were introduced to the islands in the early 1800’s; the first as a gift to King Kamehameha. It took another 20 years before they were used to regulate the cattle industry. Spanish and Mexican vaqueros, or cowboys, were brought to the Big Island to teach the Hawaiians how to control the vast herds of cattle and make a profit in the business. Cowboys in the islands are known as “paniolo,” from the word “espanol.” The first cattle ranch on Kauai was established in 1831. Not all paniolo work in the cattle industry; rodeo is a major sport on each island. 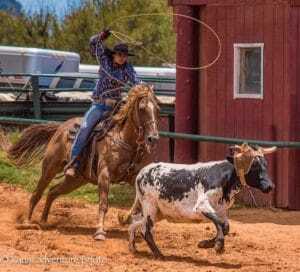 With traditional events for all riders in many venues across the island, my favorite to watch is the All-Girl’s Rodeo, held several Sundays each year at CJM stables in Poipu. These riders range in age from grade school girls to grandmothers, and showcase the intricate riding skills of these amazing women. This photo was taken with a Nikon D750, f4.5, 1/1600. Check out Week 6 if you missed last week’s photo. Feel free to comment or share your own photos!